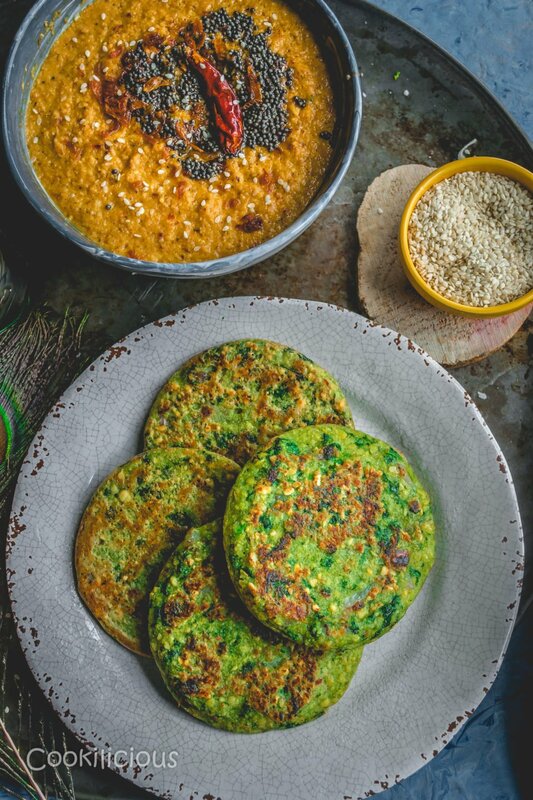 A South Indian adai/pancake made with kale, rice and lentils. Its thicker and crispier than the Dosa. Often served for breakfast or as a light tiffin snack. Adai is a South Indian dish that’s type of Crepe or Dosa. While dosa and adai are very similar to each other in terms of ingredients and type of preparation, there is a big difference. There is no fermentation required to prepare adai plus its much thicker than a dosa. Unlike dosa, which has a larger proportion of rice, Adai has more of lentils. It’s an instant recipe and one can make as many variations as one can think of by adding different vegetables to the batter. Lentils and rice is a favorite combo in any recipe. We Indian, as a community use these 2 basic ingredients to create varied recipes and present them differently. Here too, lentil and rice come together to form a batter in order to make these delicious crepes. A highly nutritious meal that’s loaded with protein that’s also fondly known as Dosa’s healthy cousin! Let’s make some delicious Kale Adai today! 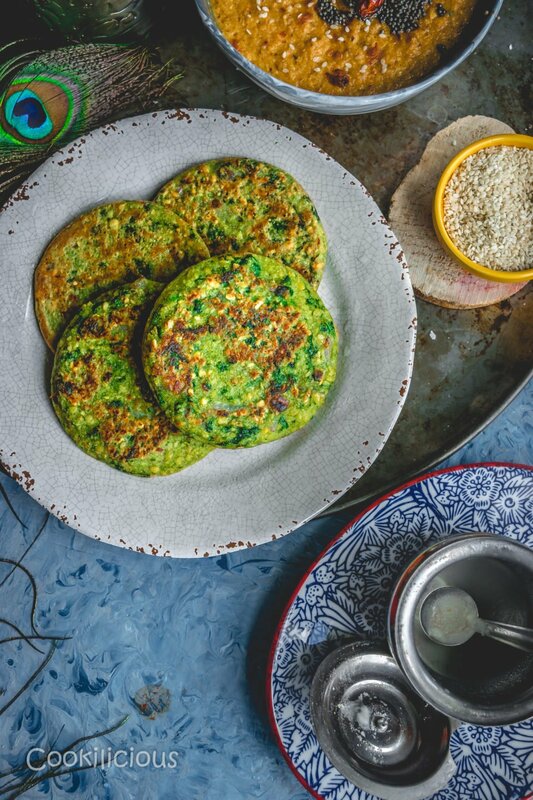 Yes, you read it right – Kale Adai! I got this inspiration from my MIL. She makes adai with spinach all the time. 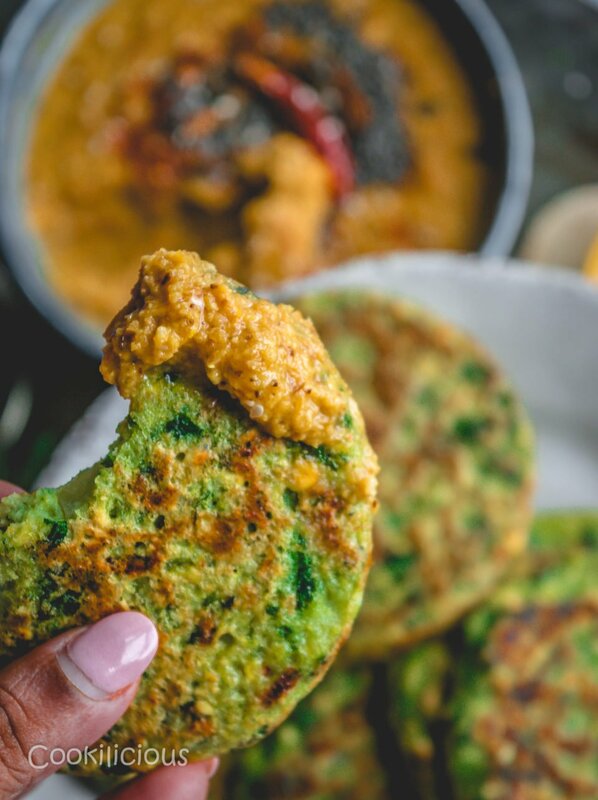 Coming from a South Indian TamBrahm household, we frequently make adai at home. My mom would serve this mostly on Sunday evenings. She would make them hot and serve us in turns. I and my brother would hold competitions to see who finishes their adai first and runs to mom for seconds. Back at that time it never occurred to me that how cumbersome it would have been for my mom to patiently stand in the kitchen and make these crepes one by one and that too on a hungry stomach! But never once we saw her complain or serve us cold adai. It would always be hot straight from the skillet and would be served to us with a smile. There are so many things one learns simply by observing people around us. It helps in shaping our personality and I am so glad I grew up in esteemed company and adapted certain qualities very early on in life. it to a very smooth paste. It should not be coarse. but I prefer a savory side dish. 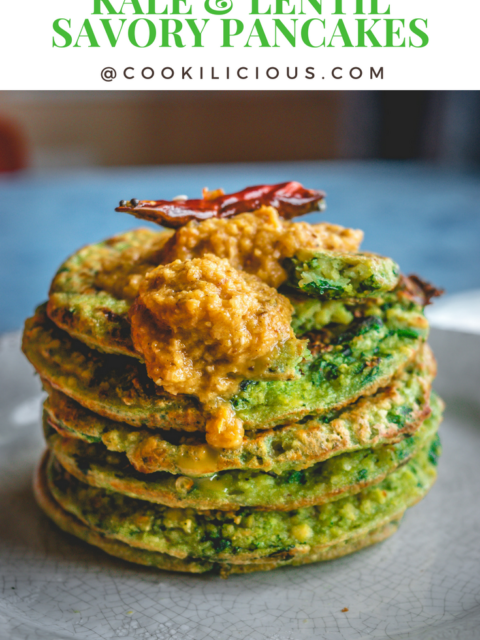 You can serve it with any of these chutneys – Green Chutney using Scallions, Carrots and Peanuts Chutney, Coriander Mint Chutney, Bell Pepper Chutney or Tomato Thokku and Amla Thokku/Indian Gooseberry Thokku. Soak rice (brown/white) for 3 hours in a vessel. Soak tur dal and chana dal in another vessel for 3 hours. Drain the water and grind the rice first by adding little water. Grind it to a very smooth paste. It should not be coarse. Empty it into a mixing bowl. Grind the drained lentils along with asafoetida, salt and dried red chillies. Grind this coarsely. Transfer this to the mixing bowl. Add chopped onions, chopped curry leaves, blanched and chopped kale and adjust the salt as required. Give the batter a good mix. Heat a skillet and pour a spoonful of batter and shape it like a pancake. Drizzle ghee around it and cook the adai on medium flame till it turns light and golden. Flip and cook the other side the same way. 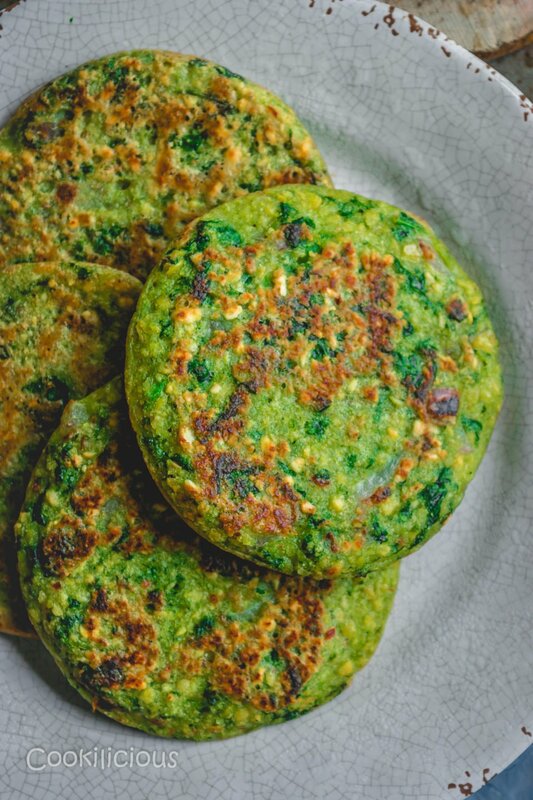 Kale Adai or Kale & Lentil Savory Pancakes are ready. Fan of crepes/pancakes/dosa or simply curious to explore more similar recipes? 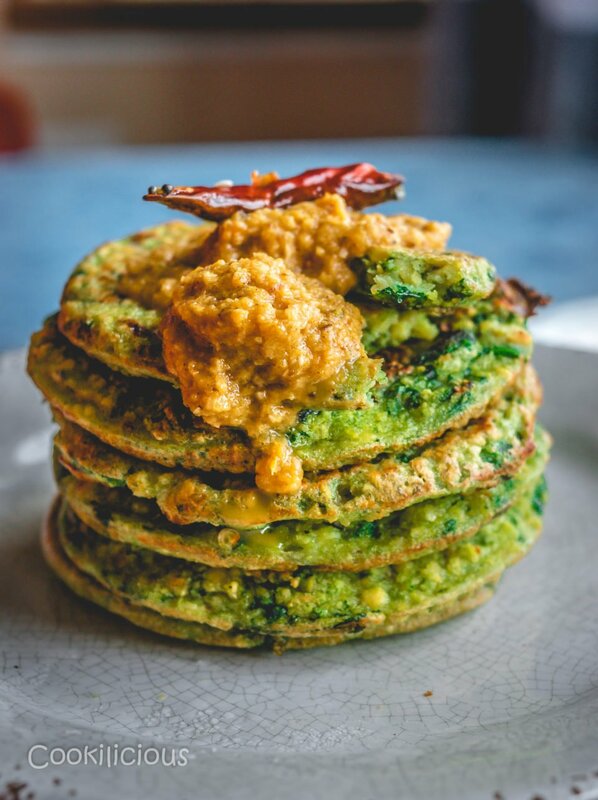 Check these out – Healthy Oats & Veggie Mini Pancakes, Savory Chickpea Flour & Mushroom Pancakes, Quinoa Paneer Mini Pancakes, Cheesy Corn Rawa Pancakes, Broccoli Oats Chilla/Pancakes, Instant Wheat Flour Dosa, Green Peas Crepes/Dosa, Instant Carrot & Oats Dosa/Crepes, Onion Rava Dosa, Potato Dosa and Vegan Lentil Crepes Using Leftover Dal. For our taste buds, I had to add finely chopped green chilies. do we have to ferment the batter or is it instant one? That color is perfection! I love savory pancakes so this recipe looks sooooo good to me! These look so delicious. I love the idea of a savory pancake but have yet to make one! These look like a great midday snack!! I love the vibrant color on these. I bet they make a filling breakfast, but I would really eat these any time of the day. These would make such a unique, delicious breakfast! Yum!